The Braves, who went 2-5 against the Dodgers this season, will host the first postseason game at SunTrust Park on Sunday. The stage is set as the Braves will take on the Dodgers in the National League Division Series, beginning Thursday in Los Angeles. 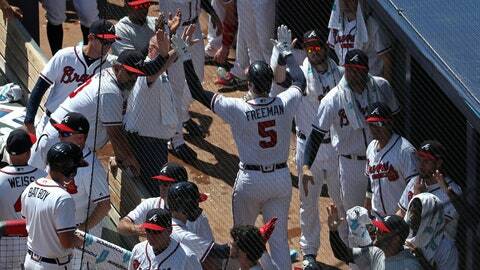 Atlanta, the NL East champions, had to wait out a tie-breaking Game 163 between the Dodgers and Rockies in the West. Behind rookie Walker Buehler flirting with a no-hitter, Los Angeles cruised 5-2 Monday. By virtue of finishing 92-71, the Dodgers have home-field advantage for the best-of-five series. The Braves will host the first postseason game in SunTrust Park’s short history on Sunday. Los Angeles dominated the regular-season series, beating Atlanta in five of their seven meetings, including outscoring the Braves 17-4 during a July 26-29 set. The lone second-half win the Braves had against the Dodgers was Sean Newcomb coming one strike shy of a no-hitter in the series finale. The Dodgers are expected to start Clayton Kershaw in Game 1, followed by Hyun-Jin Ryu. All-Star Mike Foltynewicz is the likely starter for the Braves. The 26-year-old right-hander would be the fifth Braves pitcher to make his postseason debut in a Game 1 since the team moved to Atlanta (and the seventh in franchise history), joining Kris Medeln (in 2012’s Wild Card Game), Tom Glavine (1991 NLCS), Pascual Perez (1982 NLCS) and Phil Niekro (1969 NLCS). Foltynewicz faced the Dodgers on July 27 at SunTrust, allowing four runs on six hits over five innings. The Braves, who haven’t reached the postseason since 2013 — when they were knocked out by Los Angeles in the NLDS, reached 90 wins after no fewer than 90 losses in the three previous seasons. They are the first NL team to do so since the 1991 Braves, who would reach the World Series in kicking off the franchise’s string of 14 straight division titles.